Preheat the oven to 200ºC, gas mark 6. Mix together the pesto, breadcrumbs and Parmigiano Reggiano. 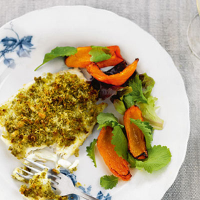 Place the cod fillets on a baking tray and press the pesto mixture on top of each cod fillet. Bake in the oven for 15 minutes, or until the cod is cooked through and the topping is crisp and golden. Serve with roasted peppers and a mild, green salad. Use any type of pesto for this dish; it works with all. The topping can be used on any firm white fish or with chicken fillets. This recipe was first published in Thu Oct 01 01:00:00 BST 2009.